Dominic Mitchell and Luke Newberry (Kieren) at today’s launch. IN The Flesh creator and writer Dominic Mitchell told a story today about the power of drama. He spoke at this morning’s London press launch for the second series of the BBC3 show. Shortly before BBC director-general Tony Hall confirmed that BBC3 will be moving online in autumn 2015 to save £50m a year. BBC3 controller Zai Bennett had been expected to introduce the screening, as he did for the first series launch 13 months ago. But, unsurprisingly, he had more pressing business back at the BBC’s New Broadcasting House just a short walk along the road. It fell to Kate Harwood, the BBC’s Head of Drama, England to welcome the gathered media. She began by saying: “The astute amongst you will have noticed I’m not Zai Bennett. “And obviously this morning’s eye needs to stay at NBH and be there for the announcement that will come later today about BBC3. Fair enough. 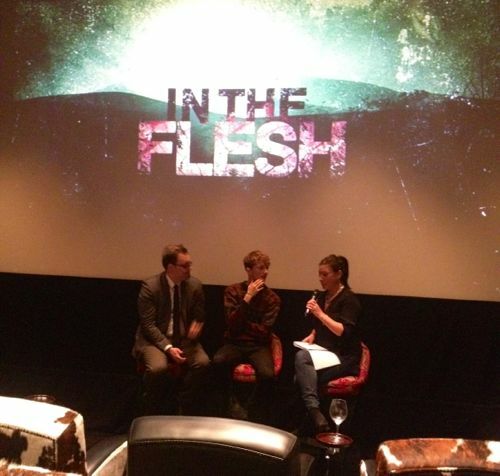 We were there to see the first episode of In The Flesh 2 and talk to those involved in making it. It would also have been tricky for them to say anything about BBC3 ahead of the official announcement. There will be more to say about the excellent In The Flesh 2 nearer the start of the series in May. Today I asked Dominic if he had received any memorable feedback about the first series. He replied: “There was one story – a lad who put on his Twitter…he said that he had watched it and him and his mum hadn’t had a very nice relationship. “He watched it and he was a big fan of the show and he got his mum to watch it with him. Today’s wristband. Best not get knocked over on the way home. The move of BBC3 online is still some 18 months away. But looking to the future – an acclaimed BBC3 drama series like In The Flesh would no doubt find a new TV home on BBC2. As well as via the BBC iPlayer. With Tony Hall careful to provide a “good news” headline today by also announcing that £30m of the BBC3 savings will go towards boosting BBC1 drama. The BBC is simply trying to manage cutbacks forced on it by the last licence fee settlement – and there are no easy answers. Yet I can’t help but wonder whether a thought-provoking, intelligent drama like In The Flesh, written by a first time TV writer, would have made the screen without BBC3? “It was so different and arresting that I thought we had to do it for BBC3. “Dominic wrote In The Flesh and submitted it to the (BBC) Writersroom. Then it was developed by BBC North through the Northern Voices scheme. So things like this really do happen. A first-time TV writer – here’s a three-part drama. In only two years. In The Flesh might well have been snapped up in any event. But with BBC3 now itself suffering from Partially Deceased Syndrome, future new writers and talents may not be so lucky. Posted in News and tagged BBC Drama, BBC Three, BBC3, Dominic Mitchell, In The Flesh, Kate Harwood, Luke Newberry, Tony Hall, Zai Bennett. Bookmark the permalink.